Today is a big day in our family - my parents are celebrating FORTY years of marriage! FORTY! In today's society - that's a HUGE milestone. And not only are they still married but they still really love each other. In fact - they still really LIKE each other! ;-) I'm thankful to have parents who have had such a strong marriage and have demonstrated to me what it should look like. They also try hard to encourage us to work on our marriage and offer to keep Harper so we can take dates or vacations alone to put our marriage first. I appreciate that SO much! 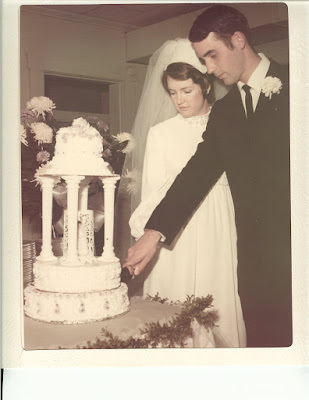 Happy 40th Anniversary Mom and Dad! I love you so much! Today has made me think about marriage. And maybe the singles day on Friday made me think about it too. Marriage is something God invented. It's amazing to have a partner for life to be with you through the good and the bad - to travel life's journey with. Marriage is also work. It's not always roses and fancy dinners and romantic music. And when you have very young children - it can easily fall into a routine of living like roommates. But marriage is also a covenant we make to each other and with God and it's NOT to be taken lightly. It makes me sad to watch celebrities get married knowing they probably won't last 5 years. It's something easily broken and thrown away in the world's eyes. I've gotten a lot of comments asking why I don't talk about Scott more on my blog. My blog is really more to document my children because they grow so fast - I want to record our memories. And I don't mind being an open book because it's MY blog. But Scott is a private person. He doesn't like having his picture on here too often and I also feel like our marriage is sacred ground and something that doesn't need to be put out in public. We have a GOOD marriage but it's not perfect. There are days when I love him so much I can't hardly stand it and I feel so thankful for him and there are days (especially when I'm hormonal) when I think "I can not live with this man another second and how am I going to support these two girls on my own?" ha! Those are usually just fleeing thoughts because divorce is just not an option with me. We are in this thing together. I'm thankful that God brought me Scott and I love being able to spend my life as his wife. I love this song by Andrew Peterson "Dancing in a Minefield" - it's a great song about marriage.